What type of toe cap do I need? Steel Blue boots have two main toe cap options – our Steel Toe Cap or Composite Toe Cap. Steel Cap boots are mandatory on many worksites. For environments with nail guns and power saws, our Steel Cap boots are more suitable. Our non-metal Composite Toe Cap boots are airport-friendly, allowing FIFO workers to easily pass in and out of security environments. We also have a range of Non-Safety work boots. Is a Steel Toe Cap stronger than a Composite Toe Cap? Both are very similar in strength. The Steel Toe Caps and Composite Toe Caps used by Steel Blue pass Australian, European and American Safety Standards. Steel Cap boots provide more cut resistance, but don’t recover as well as Composite Cap boots after impact or compression. All Steel Blue boots are Anti-Static, unless they contain an ‘EH Series’ label, which stands for ‘Electrical Hazard’. Another way you can tell if your work boots are Anti-Static is by looking for an A, O1, O2, O3, S1, S2 or S3 symbol on the license label inside the boot. The Electrical Resistant properties have been developed to stay in place throughout the life of the work boots. However, it’s important to continually check the resistance as it can deteriorate with sole wear, water or metal contamination which can lower the Electrical Resistance, taking it outside of the required range and allowing charges to more easily pass through the soling. What’s the difference between Anti-Static and Electrical Hazard boots? The type of boot you need depends on the work you do. You can find more information on the difference between Anti-Static and Electrical Hazard work boots here. Which safety standards do Steel Blue boots adhere to? What type of sole do I need? We have two Outsole options – our Thermoplastic Urethane (TPU) Outsole and Nitrile Outsole. You can find more information on the sole best suited for your job requirements here. Which sole is better for welders? A Nitrile Outsole is better for welders because it guards against short-term hot contact with welders’ slag – up to 60 seconds. What’s the lightest Steel Blue boot? Composite Cap boot styles such as the Canberra and Torquay are lighter than our Steel Cap boot options, including the Argyle and Argyle Zip. Which Steel Blue boots have a Penetration Resistant sole? All of our work boots with a Penetration Resistant component can be found here. Does Steel Blue still manufacture in Australia? Yes, we still manufacture in Australia – we’re a WA born and bred brand. Our work boots are produced in both Australia and our dedicated factory in Indonesia. Will a Black boot be hotter to wear than a Wheat coloured boot? 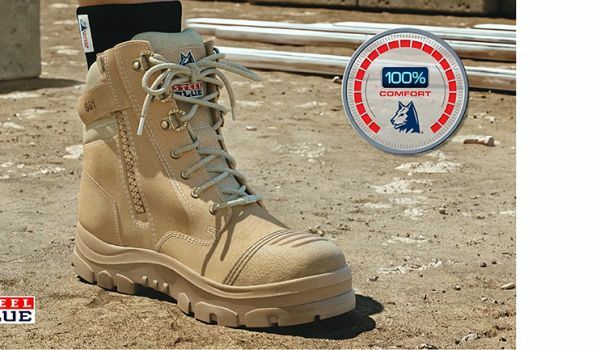 Thanks to the Baltico® and other premium linings used in our work boots, there is no difference in heat between colours in a controlled environment. This special lining is designed to wick moisture away from your foot so it stays cool and dry. How do Steel Blue’s zip attachments work? This video shows you how to use the zip attachment that’s available for our Portland work boots. What protection does the Chemical Resistant range offer? Our Chemical Resistant (TECtuff® Leather) Boots, have been tested and are compliant with the ISO Standard 13832-2. The boots are tested based on exposure to Sodium Hydroxide 30% and Sulphuric Acid 90%. If you require information about how our Chemical Resistant boots perform with other chemicals, please submit an enquiry below. Are Steel Blue boots based on AUS, EU, UK or US sizing? All Steel Blue boots are based on the Australian (AUS) sizing system. You can find your size using the conversion chart. 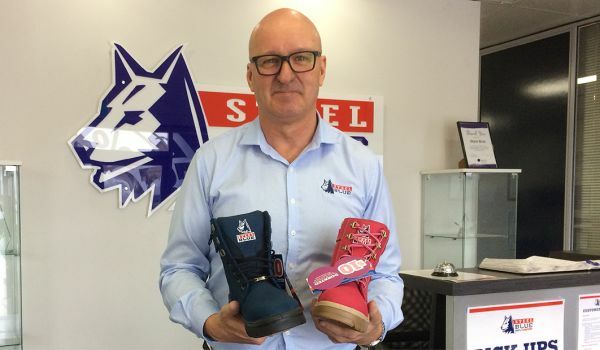 Does Steel Blue sell wide fitting boots? We offer half sizes that provide extra width without increasing the length of your work boots. What if a female wants to purchase a men’s boot? We offer a Women’s Work Boot range that has been specially developed for the dimensions of female feet to maximise comfort. If you would like to purchase our work boots in men’s sizing, women will generally be two sizes smaller than their usual size. For example, a woman who wears an Australian size 7 shoe will fit into an Australian size 5 Men’s Work Boot. However, we always recommend trying on your work boots before purchasing. How do I look after my Suede or Nubuck boots? To provide additional protection of the premium leather, you can treat your new work boots with a Leather Waterproofing Agent. To clean Nubuck or Suede Leather, brush off loose dirt using a soft bristle brush after use. How should I store my Steel Blue boots? It’s better to wear your boots regularly. Please don’t store your work boots in dark or humid conditions. If they are stored this way for long periods, the sole compound can deteriorate. What can I do to help protect the premium leather on my new Steel Blue boots? To ensure your Steel Blue boots stay in premium condition, keep them clean, wash and thoroughly dry your feet, and change your socks daily. Clean any dirt, mud or contaminates from your boots after use with a soft brush or damp cloth – do not clean your boots with solvents. See the Accessories & Boot Care page for premium Steel Blue Dubbin and Renovating Polish. Can I resole my boots? All Steel Blue boots use a direct injection process to attach the soles. If the sole has somehow become detached, we recommend replacing your work boots. Why do work boot soles sometimes deteriorate? If you store your Steel Blue boots in dark or humid conditions for long periods, the sole compound can deteriorate, which is known as hydrolysis. That’s why we recommend wearing your work boots regularly. Find out how to store your boots here. How can I extend the life of my Steel Blue boots? Applying Dubbin or Boot Polish will extend the life of the premium leather and keep your work boots looking newer for longer. Dubbin and Boot Polish also help repel water and keep the leather from drying out in warmer conditions. It’s important to ensure that your work boots are fit-for-purpose and that you adhere to the instructions provided in the packing of your Steel Blue boots. How can I dry my wet Steel Blue boots? How do I stop wearing out the leather at the front of my work boots and exposing the toe cap? When purchasing your next pair of Steel Blue boots, try a style that features a Bump Cap or Scuff Cap. Our Bump Caps and Scuff Caps are designed to protect the leather on the toe, stopping premature wear and allowing you to keep your work boots in top condition. You can browse our Bump Cap and Scuff Cap ranges. What’s Steel Blue’s 6-Month Manufacturer’s Warranty? We only use premium manufacturing technology to ensure your Steel Blue boots are built to last. If you do have a manufacturing issue with your work boots, and they’ve been correctly fitted and maintained, our 6-Month Manufacturer’s Warranty means you can receive a refund or replacement pair of Steel Blue boots. All you need to do is ensure that your claim is within 6 months of the date you bought your boots and that you have a copy of your receipt. What’s covered under the 6-Month Warranty? Our 6-Month Manufacturer’s Warranty applies to defects in the material and construction of the work boots, providing they were sold in the manufacturer’s condition. The 6-Month Manufacturer’s Warranty will not apply to work boots that have been misused, or used in a manner contrary to the purpose or suitability of the work boots. Forms of misuse may include, but are not limited to, cuts, heat or burns, exposure to chemicals, exposure to lime, excessive water or force, if the work boots are not designed or suitable for that purpose. The work boots may be considered not suitable for purpose, and the 6-Month Manufacturer’s Warranty may not apply, where the work boots were incorrectly fitted or subject to excessive wear and tear. How do I claim the 6-Month Manufacturer’s Warranty? Take your boots and your receipt back to the place of purchase. After assessing, you can exchange your work boots or be given a refund. The store will then return the work boots to the Steel Blue Quality Assurance Department so we can assess them and continue to manufacture quality Steel Blue boots. What’s Steel Blue’s 30-Day 100% Comfort Guarantee? We’re so confident in the quality and comfort of our work boots, we offer a 30-Day, money back Comfort Guarantee. If you’re not happy with the comfort of your Steel Blue boots within 30 days of purchase, you’ll receive a full refund or a replacement pair to the same value (providing they’ve been correctly fitted). Simply take a copy of your receipt to the same retailer you bought your Steel Blue boots from so you can receive an exchange to the same value or refund. How do I claim the 30-Day Comfort Guarantee? Just take a copy of your receipt to the same retailer you bought your Steel Blue boots from so you can receive an exchange to the same value or refund. Yes, it’s important to keep your receipt as a proof of purchase if you wish to retain the 6-Month Manufacturer’s Warranty and 30-Day Comfort Guarantee. While some stores keep your records on file, not all of them do, so please keep a copy of your receipt. Can't find what you are looking for? Fill out the form below and one of our staff will get back to you shortly.